Cedar Hill Cemetery is located at the end of Elizabeth Street in Havre de Grace, Maryland. 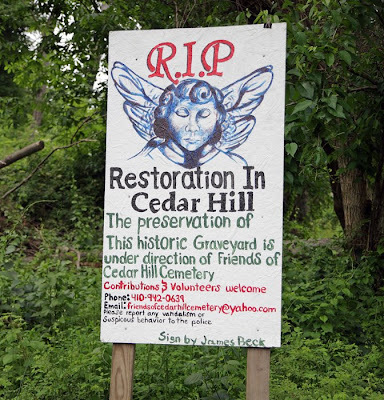 Long abandoned, it has been rediscovered and attempts are underway to preserve the old burial ground. Highball Wilson, a professional baseball player of the late 19th and early 20th centuries is buried there, along with many others, including some Civil War veterans. 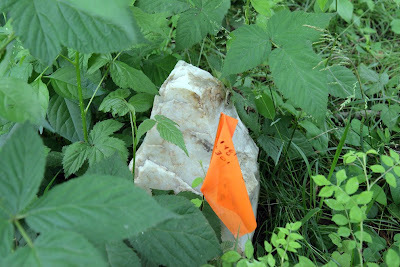 The cemetery sits next to what appears to be an old railroad cut, perhaps the line that went up to the Conowingo dam during its construction? Be warned: my guide got a good case of poison ivy walking through the place. You can find more about Cedar Hill, including a local murder story, here. There is a map here.